A bagel is a type of bread made from yeasted wheat dough. The baker forms the dough into the shape of a large doughnut and boils it briefly in water. This provides a crisp exterior and a soft, chewy interior. Bagels frequently contain fruit or other ingredients and blueberry bagels are especially popular. Fitbit provides the listed nutritional information on blueberry bagels. This information is for a generic blueberry bagel with a typical amount of blueberries. The serving size is a medium blueberry bagel weighing about 4 oz. A blueberry bagel contains a total of 288 calories. This calorie total includes 227 calories from carbohydrates, 42 calories from protein and 19 calories from fat. A blueberry bagel provides 14.4 percent of the daily value for calories, assuming a diet of 2,000 calories per day. A blueberry bagel provides 2.2 g of total fat or about 3 percent of the daily value for fat. This total includes 1 g of saturated fat, which is 5 percent of the daily value for saturated fat. A blueberry contains no trans fat or cholesterol. Blueberry bagels contain a total of 59.8 g of carbohydrates, which is about 20 percent of the daily value for carbohydrates. This total includes 45.8 g of complex carbohydrates, 10.4 g of sugar and 3.6 g of dietary fiber. This provides 14 percent of the daily value for dietary fiber. Blueberry bagels also contain 10.4 g of protein, which is about 21 percent of the daily value for protein. A blueberry bagel contains 40 percent of the daily value for vitamin D. It also has 20 percent of the daily value for vitamin B6, vitamin B12 and niacin. Additional vitamins in a blueberry bagel include 15 percent of the daily value for thiamine and 2 percent of the daily value for vitamin C. A blueberry bagel contains no vitamin A. 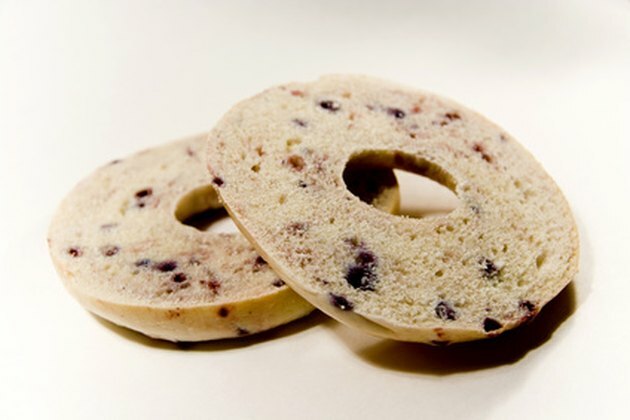 A blueberry bagel contains 482 mg of sodium or 20 percent of the daily value for sodium. They also have 19 percent of the daily value for iron, 15 percent of the daily value for zinc, 10 percent of the daily value for magnesium and 7 percent of the daily value for calcium. Blueberry bagels contain no potassium.